A tense situation due to a heavy British military presence in Boston boiled over to five protesters killed and six wounded. 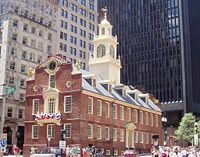 The Boston Massacre was an attack on colonist civilians by British troops on March 5, 1770, and its legal aftermath, which helped spark the American Revolutionary War. 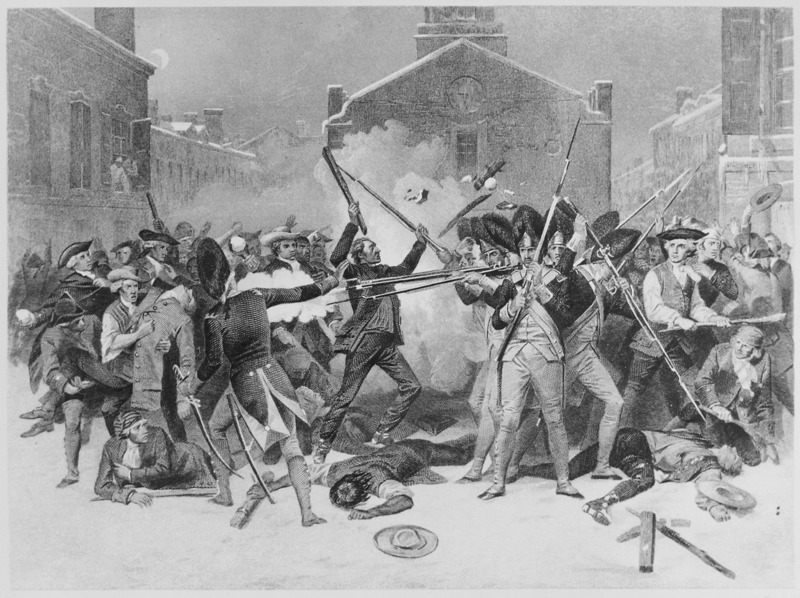 A tense situation due to a heavy British military presence in Boston boiled over to incite brawls between soldiers and civilians and eventually led to troops shooting their muskets into a rioting crowd. There were 11 men shot; five were killed and the remaining six survived their wounds. The incident began on King Street when a young wig maker’s apprentice named Edward Garrick called out to a British officer, Captain John Goldfinch, that he was late paying his barber’s bill. Goldfinch had, in fact, settled his account that day but did not reply to the boy. When Garrick remained quite vocal in his complaints an hour later, a British sentry outside the customs house, Private Hugh White, called the boy over and clubbed him on the head. Garrick’s companions yelled at the sentry, and a British sergeant chased them away. The apprentices returned with more locals, shouting insults at the sentry and throwing snowballs and litter. White sent a messenger to the main guard for reinforcements. The officer of the day was Captain Thomas Preston. According to his account, he dispatched a non-commissioned officer and 12 privates, all soldiers of the 29th Regiment of Foot, and he followed soon after. The mob grew in size and continued throwing stones, sticks, and chunks of ice. A group of sailors and dockworkers came carrying large sticks of firewood and pushed to the front of the crowd, directly confronting the soldiers. As bells rang in the surrounding steeples, the crowd of Bostonians grew larger and more threatening. In the midst of the commotion, Private Hugh Montgomery was struck down onto the ground by a piece of ice. He fired his musket, later admitting to one of his defense attorneys that someone had yelled “Fire!” All but one of the other soldiers shot their weapons into the crowd. Their uneven bursts hit 11 men; three died instantly, one a few hours later, and a fifth several days later. The other six wounded men survived. 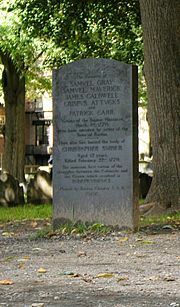 Three Americans—rope maker Samuel Gray, mariner James Caldwell, and an African American sailor, Crispus Attucks—died instantly. 17-year-old Samuel Maverick, struck by a ricocheting musket ball at the back of the crowd, died the next day. 30-year-old Irish immigrant Patrick Carr died two weeks later. The next day, royal authorities agreed to remove all troops from the center of town to a fort on Castle Island in Boston Harbor in an attempt to keep the peace. Captain Preston and the soldiers were arrested and scheduled for trial in a Suffolk County court. John Adams, Josiah Quincy II, and Robert Auchmuty acted as the defense attorneys, with Sampson Salter Blowers helping by investigating the jury pool. Massachusetts Solicitor General Samuel Quincy and private attorney Robert Treat Paine, hired by the town of Boston, handled the prosecution. The Boston Massacre threatened to alienate moderates from the Patriot cause so the Whig Party members took counter measures. They made certain that the British soldiers received a fair trial; Paul Revere helped to supply the evidence. A leading patriot, John Adams, was lawyer for the defense. To let passions settle, the trial was delayed for months, unusual at that time, and the jurymen were all chosen from towns outside Boston. Tried on his own, Preston was acquitted after the jury was not convinced that he had ordered the troops to fire. 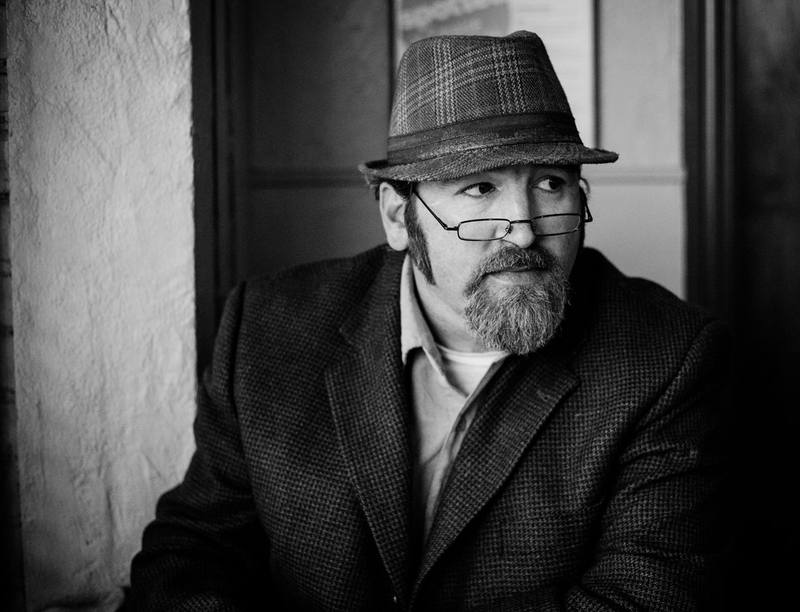 In the trial of the soldiers, Adams argued that if the soldiers were endangered by the mob they had the legal right to fight back, and so were innocent. If they were provoked but not endangered, he argued, they were at most guilty of manslaughter. The jury agreed with Adams and acquitted six of the soldiers. Two privates were found guilty of manslaughter and punished by branding on their thumbs. The jury’s decisions suggest that they believed the soldiers had felt threatened by the crowd. Patrick Carr, the fifth victim, corroborated this with a deathbed testimony delivered to his doctor. Before or after the Tryal, Preston sent me ten Guineas and at the Tryal of the Soldiers afterwards Eight Guineas more, which were. . .all the pecuniary Reward I ever had for fourteen or fifteen days labour, in the most exhausting and fatiguing Causes I ever tried: for hazarding a Popularity very general and very hardly earned: and for incurring a Clamour and popular Suspicions and prejudices, which are not yet worn out and never will be forgotten as long as History of this Period is read. It was immediately bruited abroad that I had engaged for Preston and the Soldiers, and occasioned a great clamour…. The Boston Massacre is one of several events that turned colonial sentiment against British rule. Each of these events followed a pattern of Britain asserting its control, and the colonists chafing under the increased regulation. Events such as the Tea Act and the ensuing Boston Tea Party were examples of the crumbling relationship between Britain and the colonies. While it took five years from the massacre for outright revolution to begin, the Boston Massacre foreshadowed the violent rebellion to come. It also demonstrated how British authority galvanized colonial opposition and protest. Beier, Anne. Crispus Attucks: Hero of the Boston Massacre. New York: Rosen Pub. Group. 2004. Boston Staff. A short narrative of the horrid massacre in Boston, perpetrated in the evening of the fifth day of March, 1770, by soldiers of the 29th Regiment, which with the 14th Regiment were then quartered there; with some observations on the state of things prior to that catastrophe. Freeport, NY: Books for Libraries. 1971. Flexner, James Thomas. Washington, the Indispensable Man. Boston: Little, Brown. 1974. Hansen, Harry. 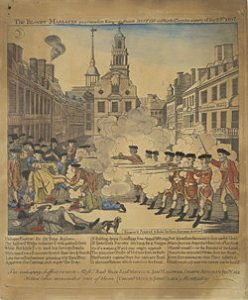 The Boston Massacre; an Episode of Dissent and Violence. New York: Hastings House. 1970. Zobel, Hiller B. The Boston Massacre. New York: W.W. Norton.